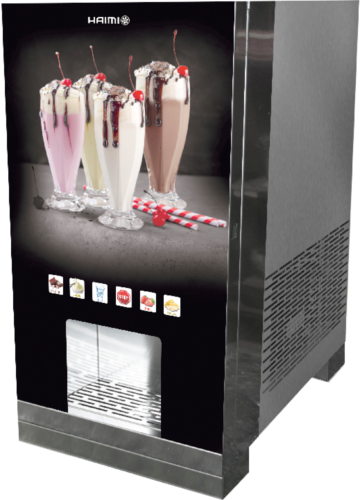 Our cold smoothie dispensing machines are ideal for hotels, restaurants, catering, and sports centers. They are ideal for large number of services providing a great solution to the Horeca channel. They give instant cold smoothies, enabling a fast enjoyment of their quality. This dispensing machines range is designed for any type of powder product such as smoothies, milkshakes or cold teas... They have 4 channels and a hot self-cleaning mechanism. The containers are stored inside. They are entirely manufactured in stainless steel and thanks to their electronic board they can be easy and conveniently set up. On top of that they have a capacitive touchscreen, and its lighted front board can customized with you logo or preferred design. They have 4 channels plus one extra for water.